One of my favourite techniques for repairing woven textiles is the hemmed patch. There are many repair techniques, and in “the olden days” it was deemed important that a repair would be as inconspicuous as possible. However, the least visible techniques are generally also the weakest, and for every item in need of repair, one had to weigh up strength against invisibility. 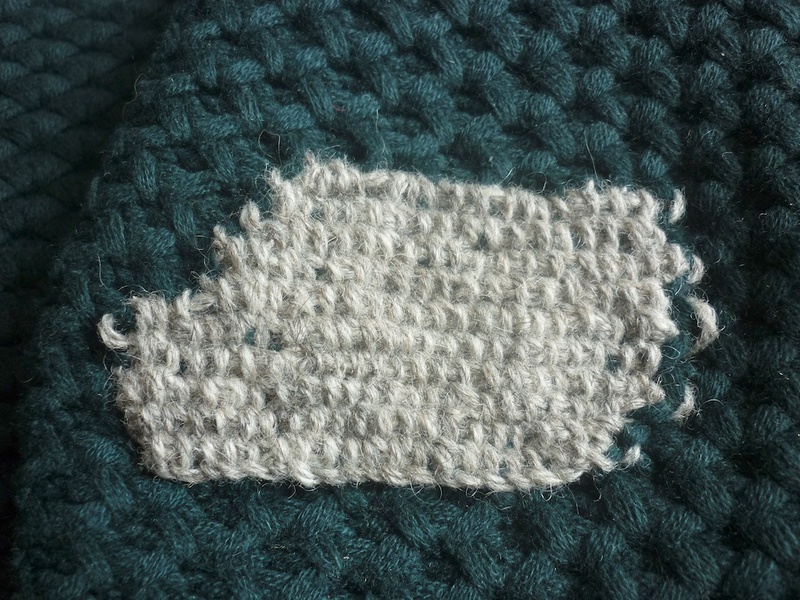 One technique that makes for invisible repairs is the oversewn patch. 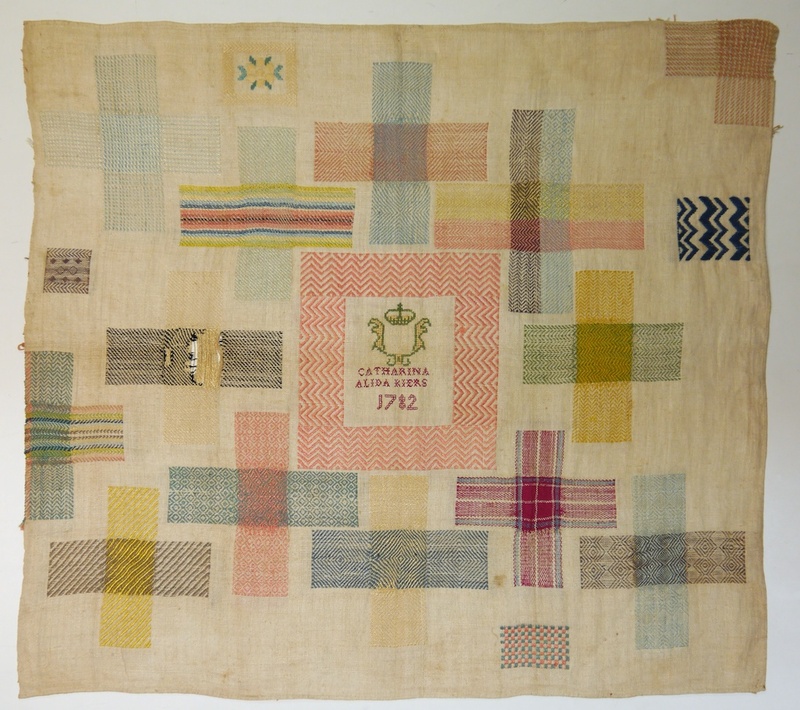 This vintage sampler shows the oversewn patch technique in all its glory; as you can see, it’s possible to make a repair nigh on invisible. Not only can you perfectly match a pattern, the sewing technique used makes for a very smooth transition from background fabric to patch. 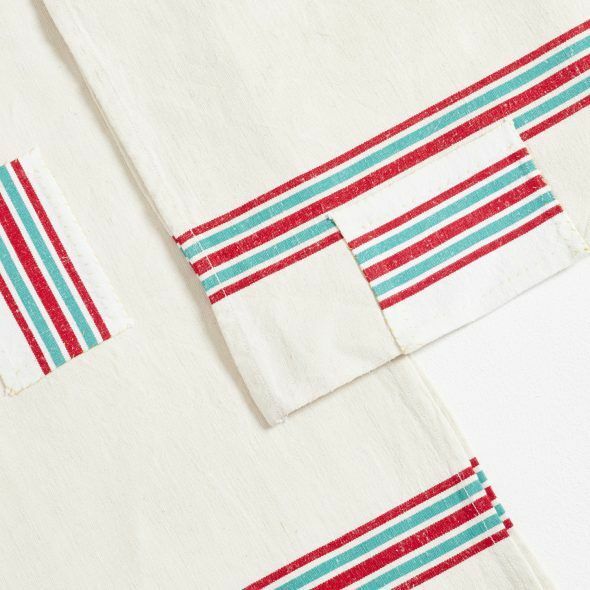 On a blouse or shirt this would be a good technique to use, but if you want to repair tea towels, which get washed frequently, you’d soon end up with fraying seams, and very likely, new holes where the stitching isn’t quite strong enough to withstand the washing process. 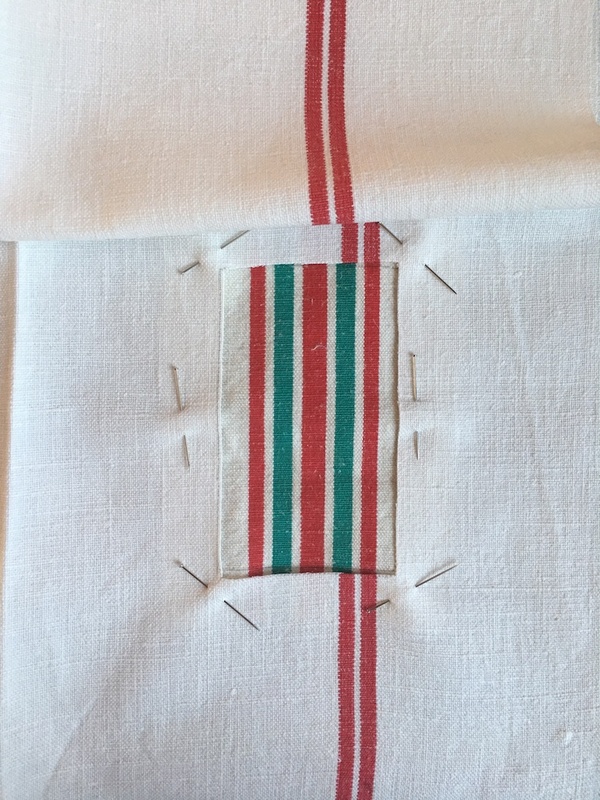 A hemmed patch, on the other hand, encases the raw edges of the hole and patch inserted, and the double line of stitching ensures a strong repair. Of course, it is still possible to match the pattern, but the hem will always show up. My favourite books on mending will discuss the pros and cons of each technique, taking these kind of things into account. 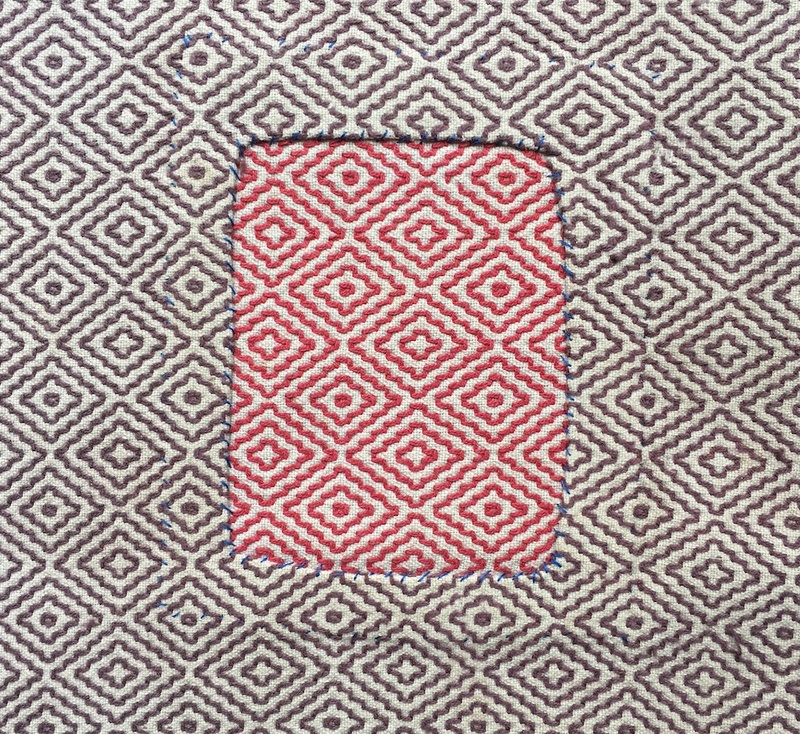 When I first started using the hemmed patch, I was lucky to have a number of tea towels in different colourways of the same weave pattern. It allowed me to pattern match, yet make the repair stand out even more through the use of different colours. I was intrigued by this disruption of the pattern, and I wanted to explore this concept further. 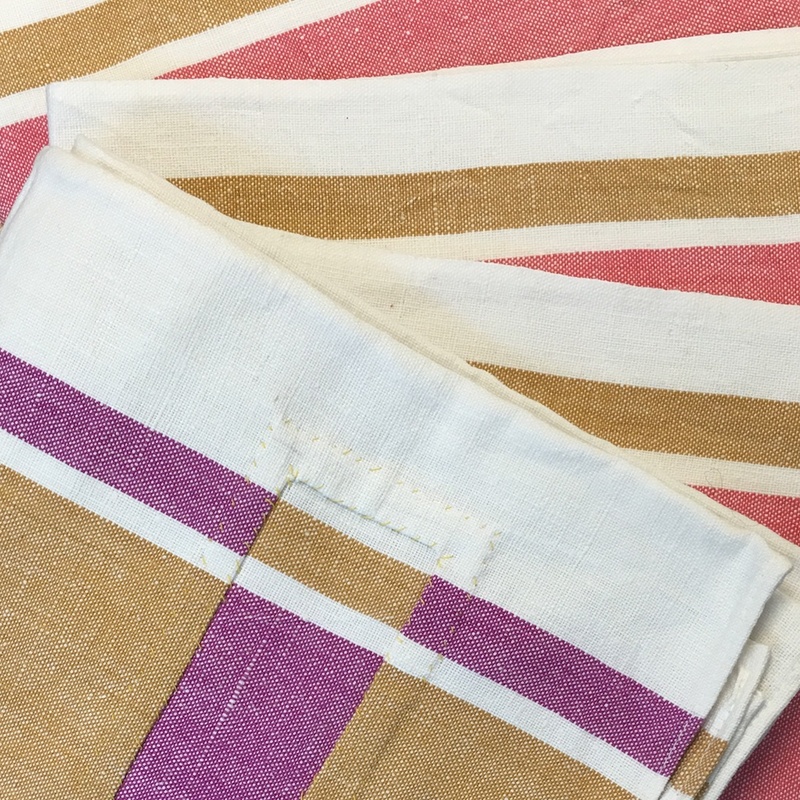 I sourced a pile of striped vintage linen tea towels, cut patches from the striped sections of one sacrificial tea towel, and started playing around with different ways of disrupting the stripes. 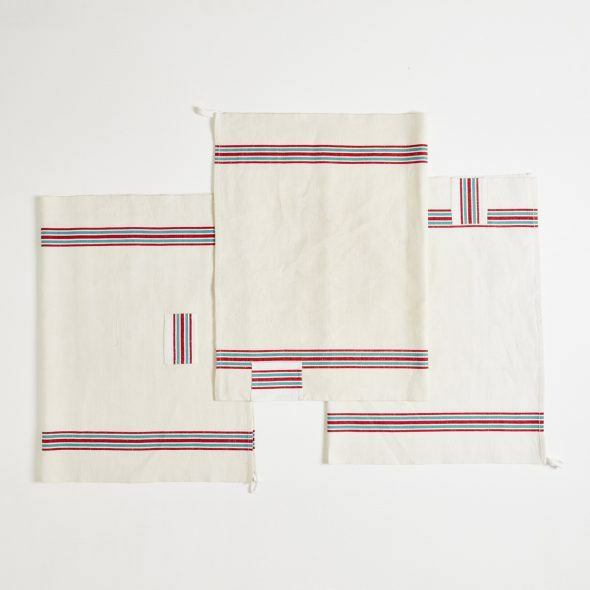 The end result hints at other design possibilities for weaving the fabric used for these towels. It was hard to stop, so I made a whole pile of these towels, and the green and red striped ones are exclusively available through The New Craftsmen. I’m very excited to announce a extraordinary Visible Mending Programme collaboration with one of Brighton’s finest vintage clothes shops: Wolf & Gypsy Vintage. I have been shopping at Wolf & Gypsy since they first opened their doors many a moon ago, so it was only a matter of time I’d walk in with some visibly mended clothes. 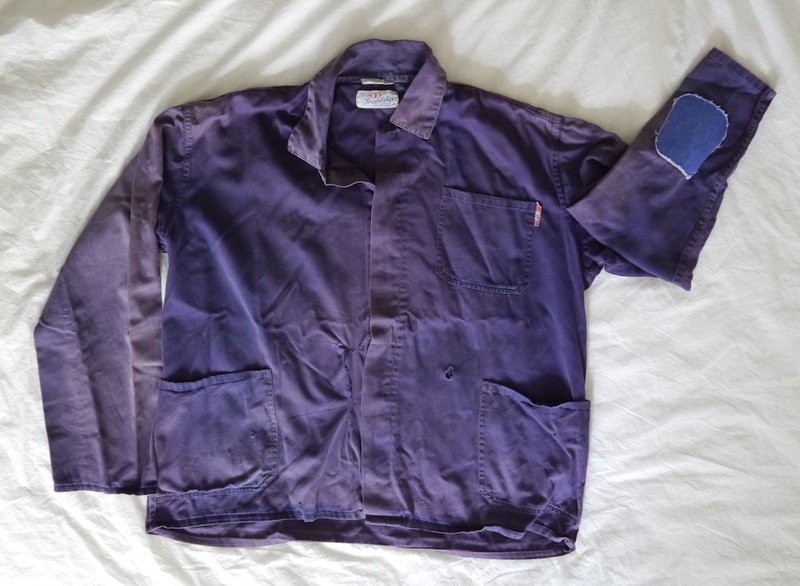 Laura, the owner of Wolf & Gypsy, loved the look of my repaired French workwear so much, that she asked me to create a micro-collection for her. And that’s exactly what I did. All four pieces I repaired are of an indigo blue, and I think they were all dyed with a chemical dye rather than actual plant-based indigo. I decided to provide a contrast by using vintage Japanese natural indigo-dyed fabrics; by only using yellow sewing and embroidery threads I highlighted all the hand stitching. Laura carefully hand picks all the garments for her shop, and I have used the same attention to detail in making the repairs. 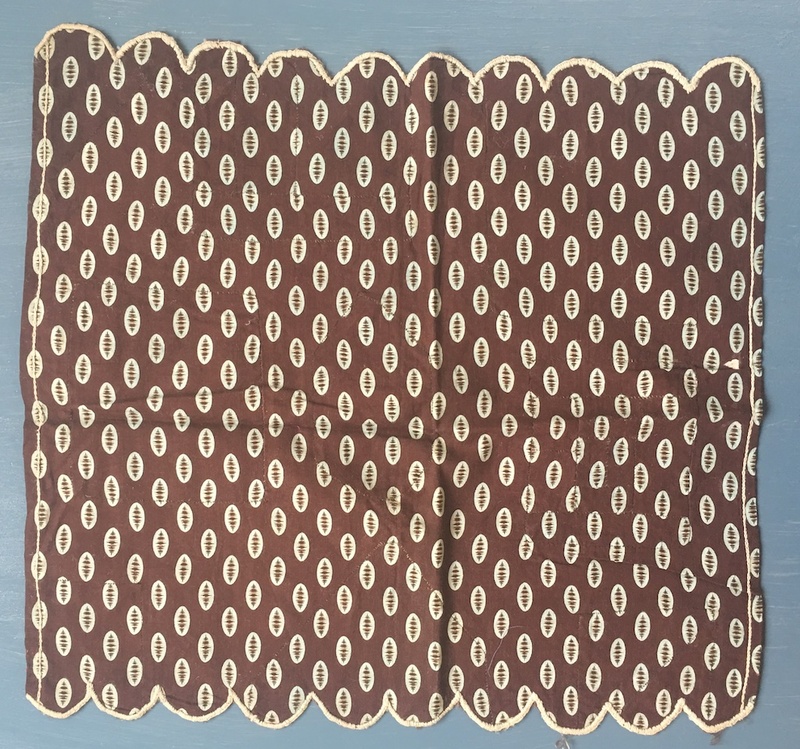 Although the fabric I used for patching is Japanese, I steered clear of employing Japanese embroidery techniques, such as sashiko and boro. Instead, I found my inspiration from my old, and very Western, needlework books. 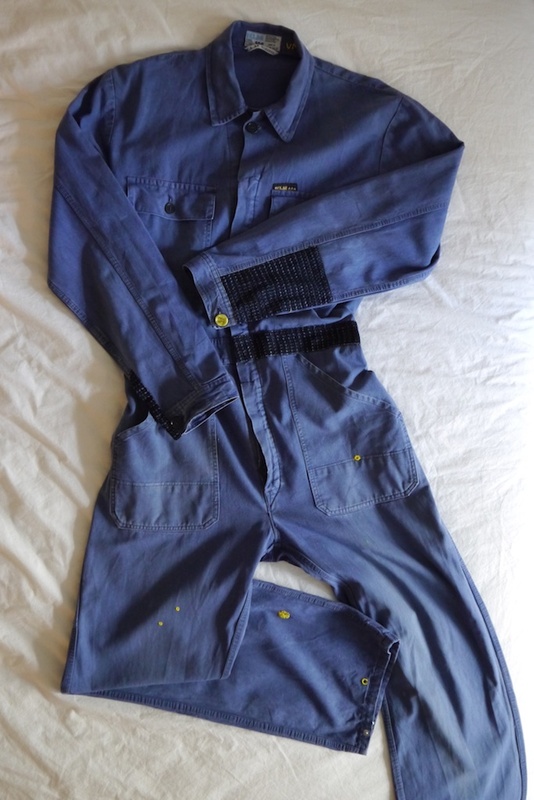 Being from The Netherlands, I could only ever repair some overalls originating from my home country. KLM (Koninklijke Luchtvaart Maatschappij) is the Royal Dutch Airlines. 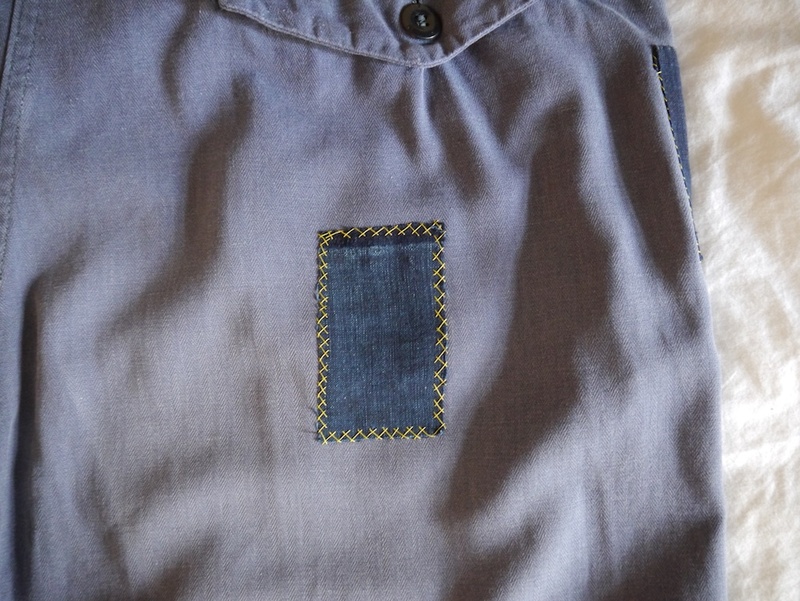 Overalls repairs: fraying cuffs rebound with fabric, small holes highlighted with eyelet embroidery. 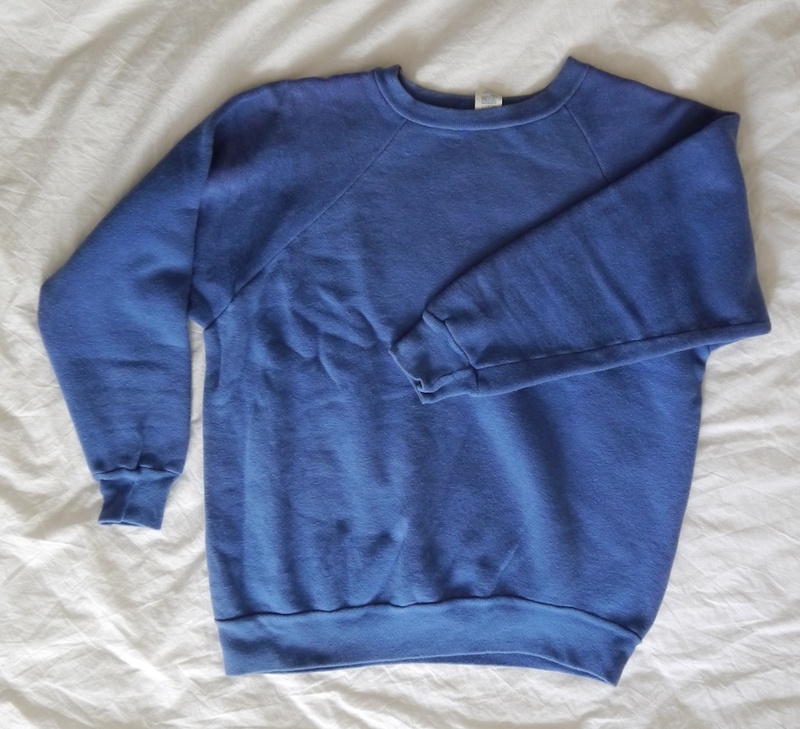 Sweatshirt repair: darn in multiple colours, created with my Speedweve. 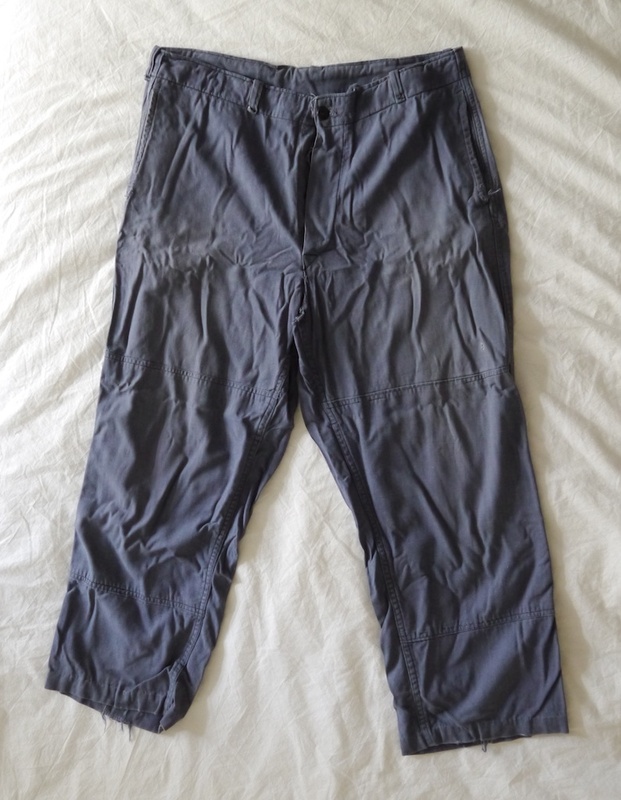 These are very similar to the trousers I walked into the shop with and which led to this gig to start with. I’m happy with the look of the binding around the pockets (see picture above), and a fabric patch which shows fading. Most of all though, I love the tailor’s buttonholes, handstitched in a perlé cotton to make them stand out. I love the fading on the patch, which I’ve sewn in using the flannel patch method, more commonly used for, you guessed it, flannel! I love working proper tailored buttonholes, and this commission was a good excuse to really make ’em stand out! Trousers repairs: fraying pockets rebound with fabric, fraying buttonholes restitched, hems re-sewn, patches, waistband cord ends replaced. Possibly my favourite of the series: the pockets had a lot of tiny holes in them, so these got covered up by pocket-sized patches. One sleeve had a very ugly and stiff iron-on patch. This peeled off easily, and I replaced it with a classic felled patch. 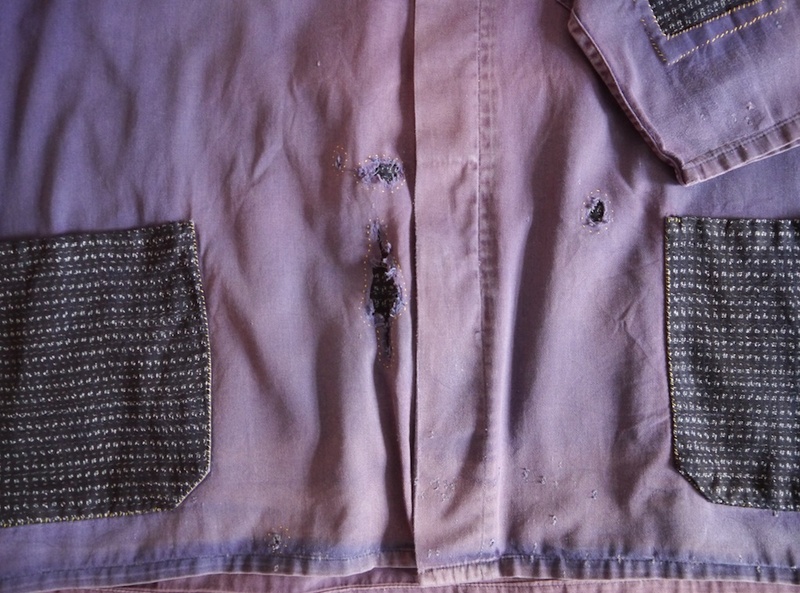 Jacket repairs: buttons replaced, various patches, fraying cuffs rebound. 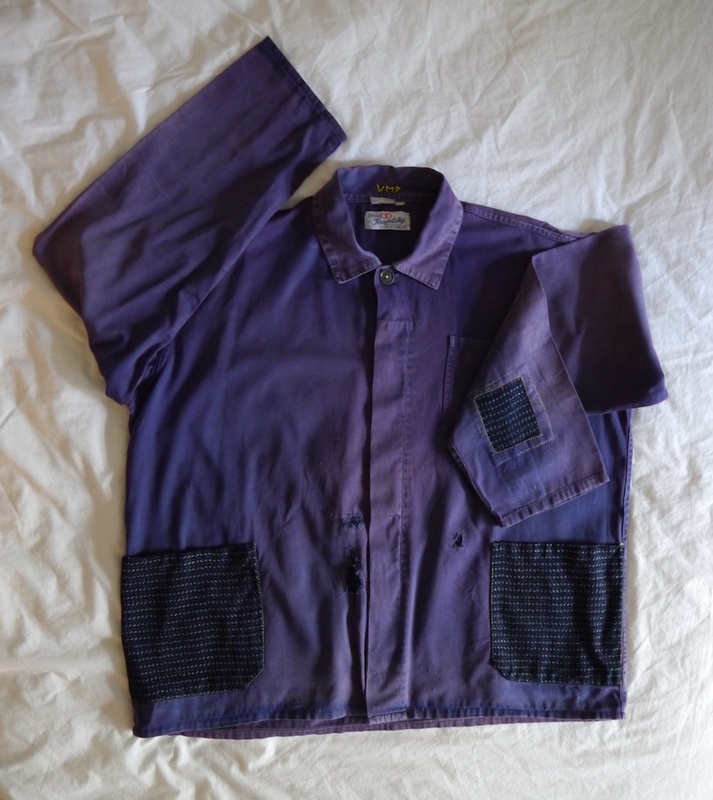 If you find yourself in Brighton during the month of November, then you can avail yourself of one of these fine Visible Mending Programme garments. Each one comes with a special card that details the repair materials and techniques used. I hope four lucky people will enjoy wearing these as much as I enjoyed repairing them! 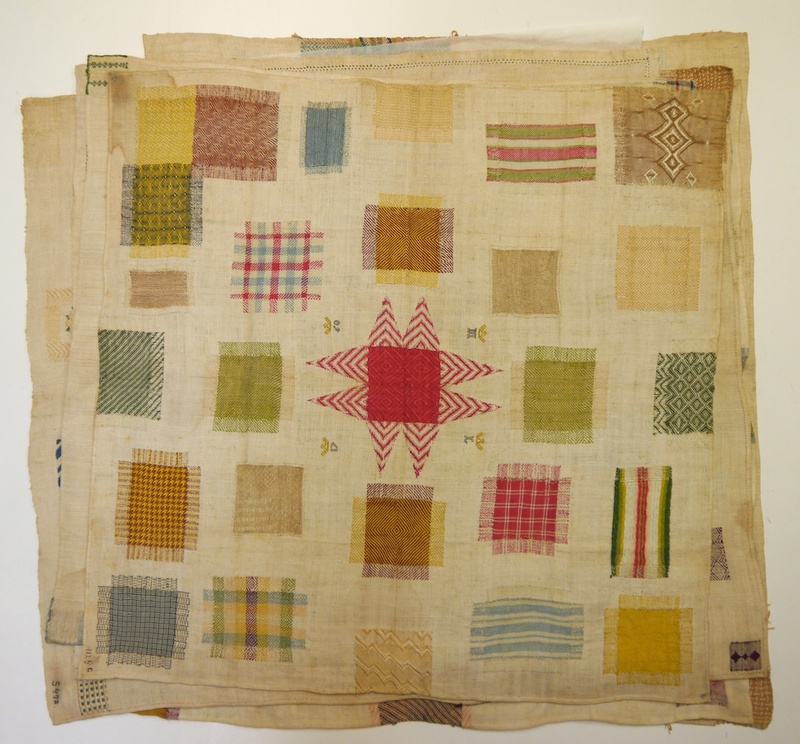 A few weeks ago I visited the Fries Museum archives, and their textile conservator Gieneke Arnolli shared with me many beautiful textiles related to mending and repairing. It was the first time I saw darning samplers in real life. 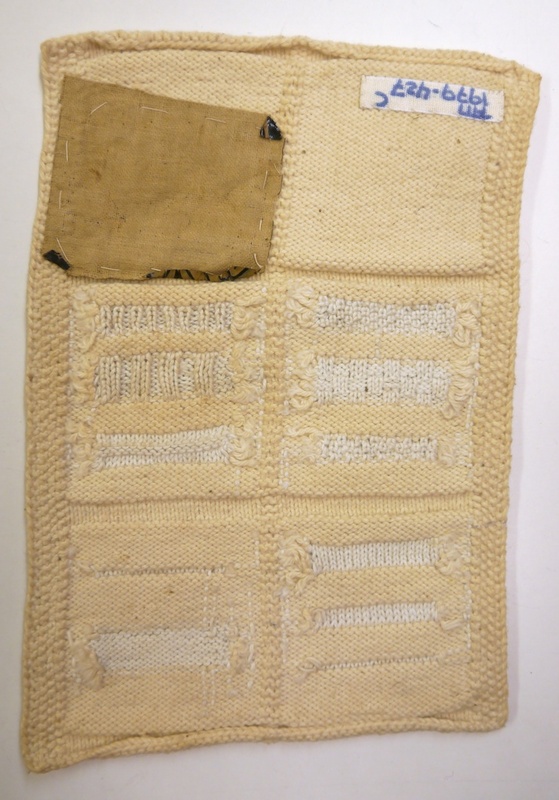 These samplers were educational tools for young girls, teaching them how to repair woven fabrics. However, the Fries Museum also holds many samplers for learning how to repair knitted fabrics. Needless to say that as I particularly enjoy repairing knitwear, these were possibly even more exciting than the darning samplers I shared in my previous post! 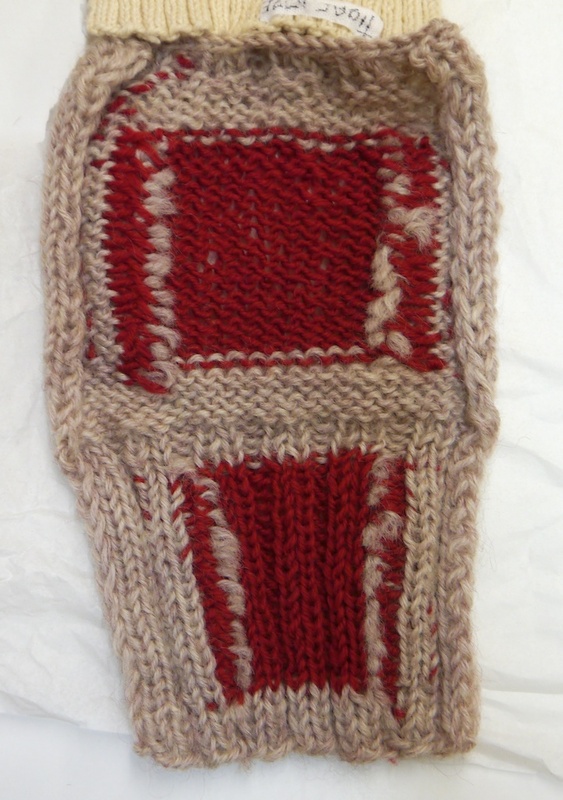 The above knitted darning sampler is different from most of the samplers in the collection, as it was knitted from and repaired with wool. Most other samplers used cotton. Incidentally, it is also similar to the technique I used for repairing the Knitting & Crochet Guild Cardigan commission. As with most of these samplers, the back of the fabric is just as beautiful and interesting as the front. 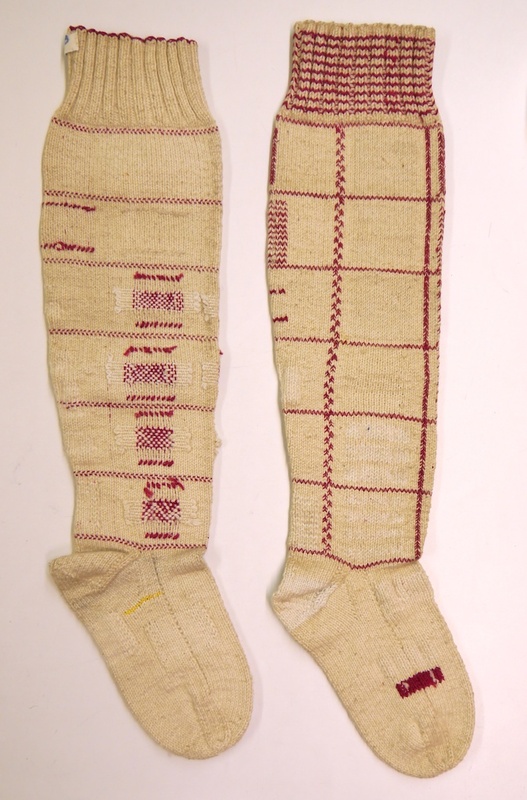 The knitted darning samplers can be split into two main categories: the first is the sampler in the shape of a sock or stocking, knitted in the round; the second is the sampler in the shape of a rectangle, knitted flat. 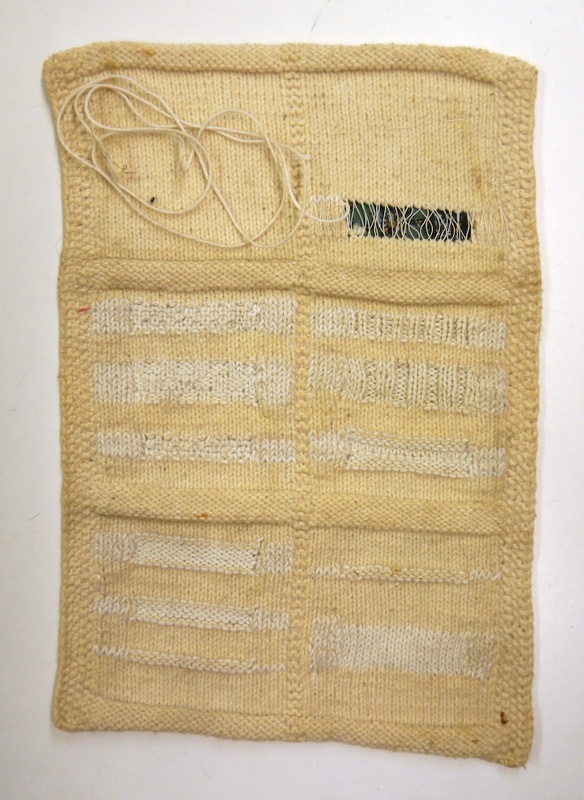 Often, the sampler is divided into squares, using red yarn, each containing a repair. Some girls practised the same technique over and over again, whereas others show a great range of techniques. The right stocking above shows mostly Swiss darning or duplicate stitching. 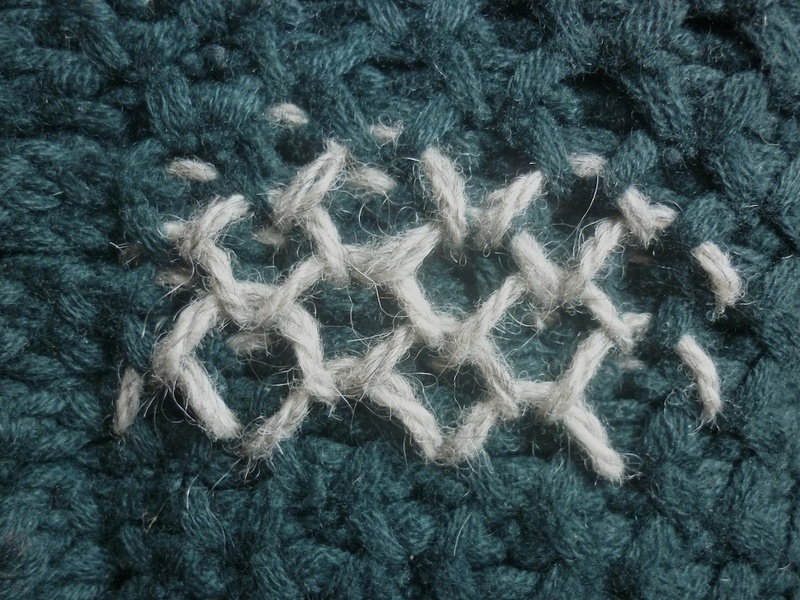 This technique of emulating knitted stitches is called ‘mazen’ in Dutch. It also shows grafting, like the two single rows of red stitches in the right stocking above. 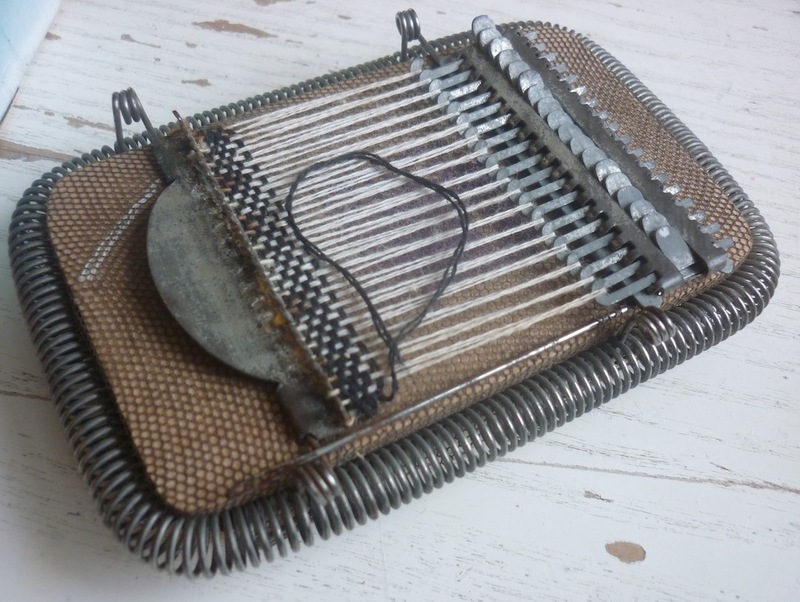 It is a way of replacing a missing single row of stitches with a new row, using a blunt darning needle. Incidentally, you might also know grafting as a way of closing the toe on a sock, instead of binding off. Another technique that was part of sock repair, was reknitting the heel. You can see this in the picture above in the right stocking. For this, the heel flap and heel turn (respectively called ‘big heel’ and ‘small heel’ in Dutch) is unpicked. This leaves you with a hole which has a row of live stitches at the leg side and at the foot side, and edges that were originally the picked up stitches for the gussets. The stitches at the leg side are picked up on one needle, and the edge of each gusset is also picked up on a needle each. The heel flap is knitted as normal, but at the end of each row the last stitch is worked together with a stitch from the gusset edge. Once the heel turn is worked the last row is grafted onto the live stitches at the foot end. Tadah! A new heel! The most common Swiss darn is executed on thinning fabric. This is relatively simple, as you can use the original stitches as a guideline. However, it is also possible to Swiss darn a hole. I also used this technique on my Knitting & Crochet Guild commission. 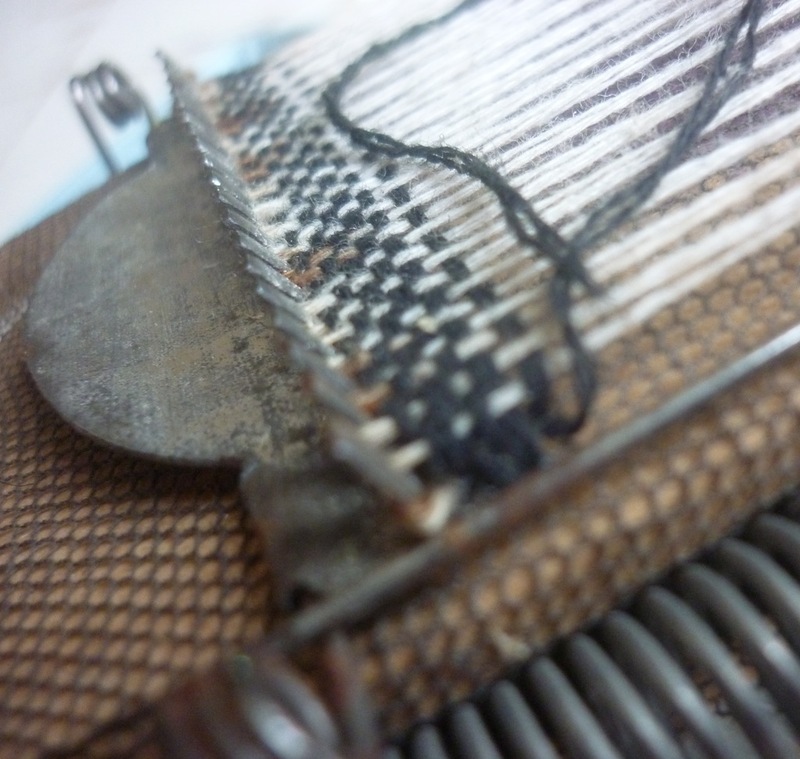 The sampler above was never finished, and this gives us a glimpse of the technical aspects of Swiss darning a hole. You can see that the hole is neatened, and then a foundation is layed with sewing thread. This foundation will make Swiss darning easier, as it holds the loops of the yarn in place as the rows are worked. When the holes to be Swiss darned are on the larger side, then you can first baste a piece of lino or floorcloth at the back. This will prevent the hole from being stretched out of shape. At the same time the lino or floorcloth is flexible enough to allow for easier needle and fabric manipulation. Not all samplers take the shape of socks or squares. I particularly liked this small undergarment. 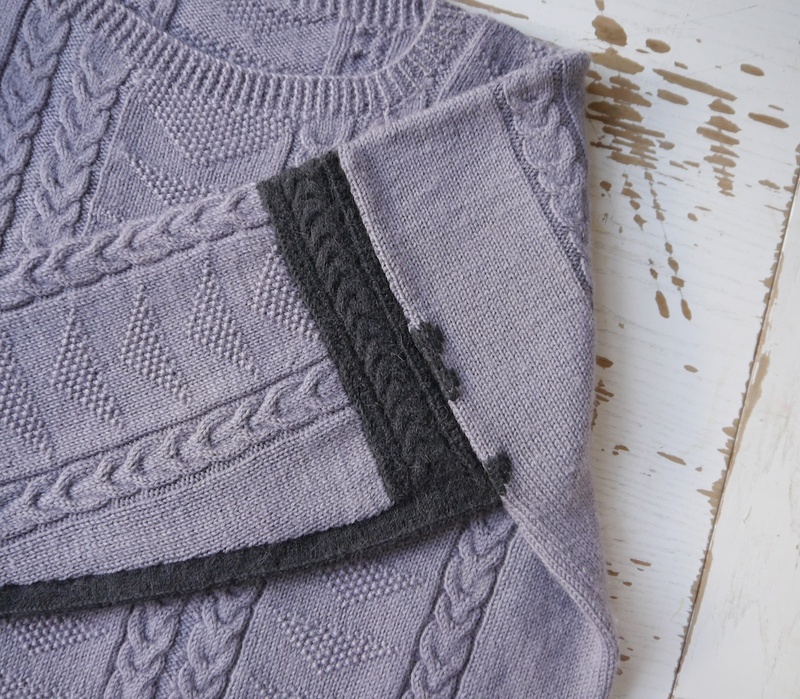 It has beautiful underarm gussets, and a lovely sideseam stitch. Clearly no learning opportunity was wasted, as I’m quite sure the girls would first have to knit the sock, stocking, or other garment, before making holes in it to learn how to repair them. I think my darning workshop students get a good deal here, as I provide them with knitted squares to practise on! The final sampler I want to share with you may not seem as a high point: at first glance it looks rather unassuming. The most exciting darning sampler of all! It has yellowed a lot, the top half seems rather lumpy-bumpy, and apart from the lace stitches, not much seems to be going on. Upon closer inspection, however, I discovered that the lumps are actually sock heels. Furthermore, most of this small sampler is covered in nigh-on invisible repairs. The repairs are exemplary on the front as well as the back. Very neatly finished, the repairs really are virtually invisible. I think this was a stocking sampler of sorts. Not only are there heels hiding, there’s also a seam stitch right through the middle, with calf decreases alongside it. Then there are the stitches often used in knitted stockings: two types of ribbing, and a number of fancy stitches that would work well on stockings. It’s like a deconstructed stocking, broken down in its essential elements. We will probably never know why the maker chose to do it this way, rather than by knitting an actual stocking. 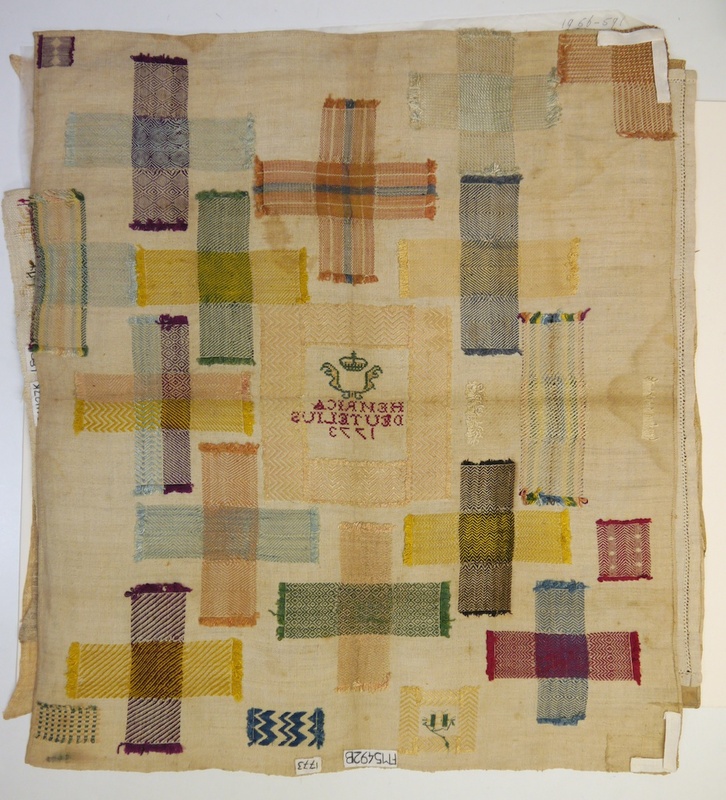 I hope you enjoyed reading about my foray into darning samplers, and I would like to thank the Fries Museum and Gieneke Arnolli in particular for inviting me to see these textiles that are not on public display at the moment. I have learnt a lot from them, and their possibilities as sources of inspiration are like a map that will allow me to travel in many directions! Today I would like to share some more from my visit to the Fries Museum. This was the first time I got to see darning samplers in real life; after reading about them, and seeing pictures of them on the internet and in books, it was a very exciting day for me! 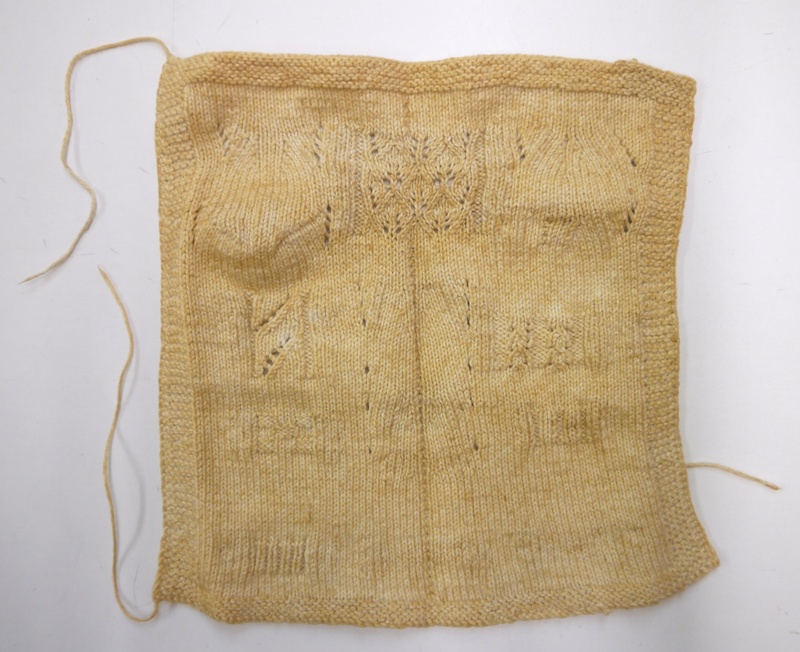 As I’m still learning about darning samplers – I’m by no means an expert – I can share with you some of the things as I understand them at this point in time. And of course, loads of pictures! 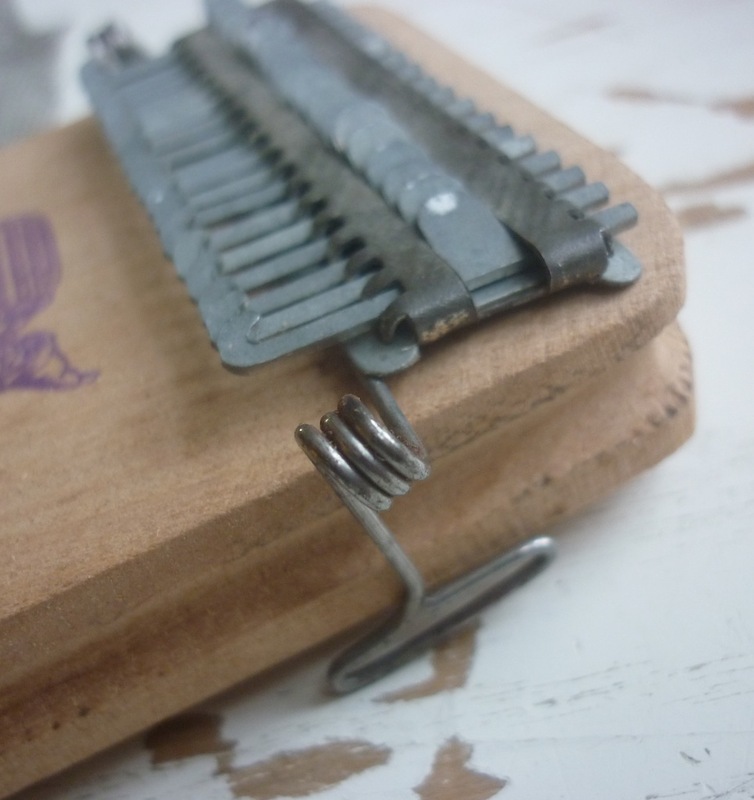 Many, if not most, girls were taught useful needlecrafts. This seemed to consist in the very least of sewing, knitting, and repairing woven and knitted fabrics. 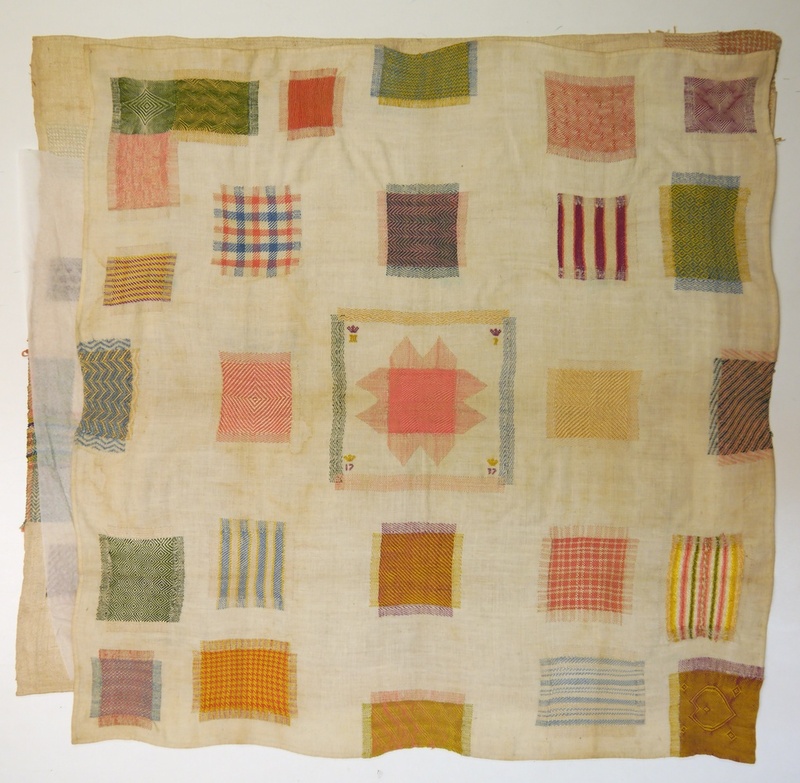 Other skills that were often taught were marking of linen with initials or little symbols in order to identify items during laundry day, and fine needlecrafts such as embroidery, needlepoint, crochet, netting, tatting, etc. The basic skills were needed for any girl seeking employment as a maid, or other household help. However, any lady would also have to learn these things as part of their education in becoming a useful wife. The fine needlecrafts were deemed essential for the ladies in a household, as it would allow them to be occupied, show off their elegant hands, and make things to sell at bazaars to other ladies, all in aid of any number of charitable causes. 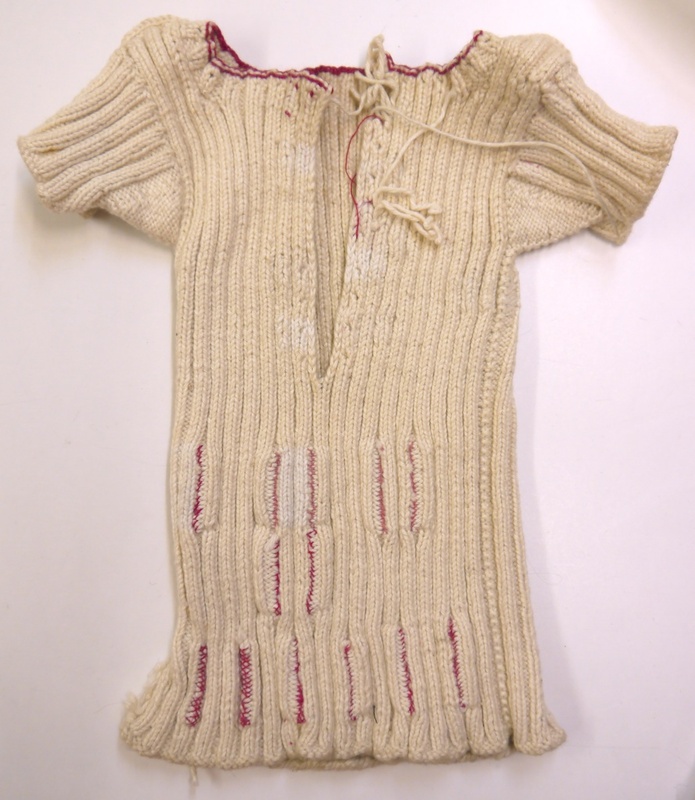 ‘stoppen’ = repairing a hole in woven or knitted fabric by means darning, i.e. by weaving in a patch. ‘doorstoppen’ = repairing a thin patch in a woven fabric by reweaving the thin area in the weave pattern of the original fabric. This is sometimes called ‘damask darning’ in English, although that term is also used for a similar technique for decorative purposes. 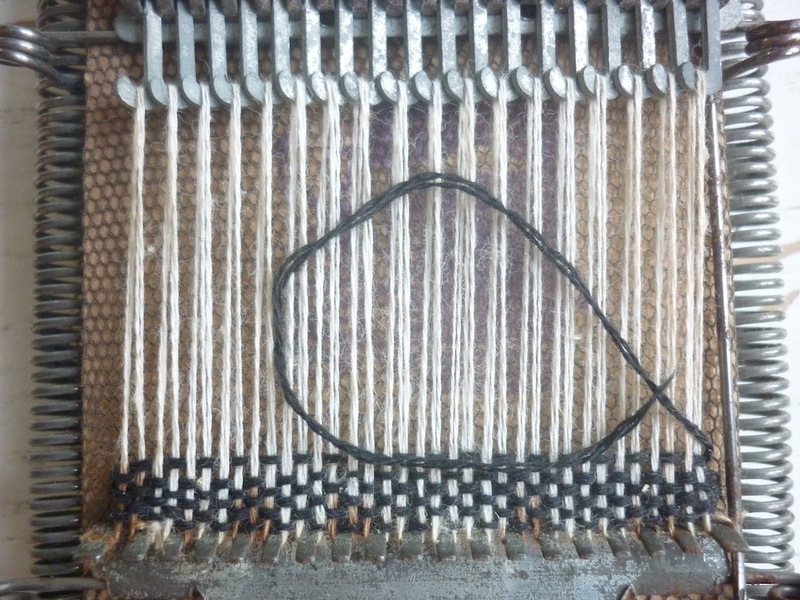 ‘mazen’ = repairing knitted fabric, by means of Swiss darning or duplicate stitching techniques, which emulates the knit stitches. And for completeness: a ‘stoplap’ is a darning sampler. 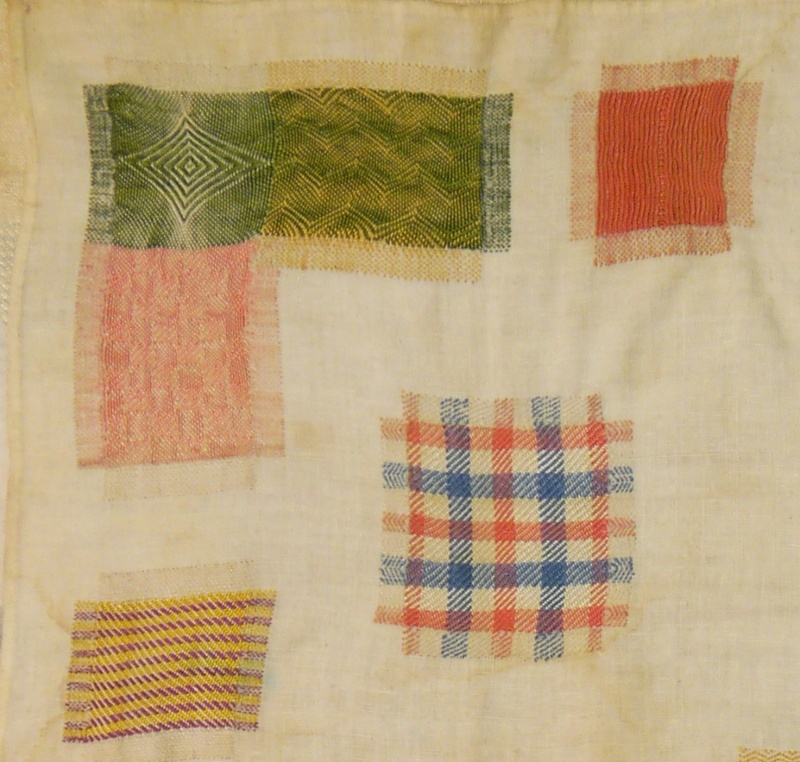 A number of the darning samplers in the Fries Museum contain a woven patch that emulates knitting, like the one in the top-right in the close-up picture above. Gieneke Arnolli, the textile conservator of the museum was most intrigued by these, and has examined them up close. It turns out that these are made by first spanning threads across from left to right, and then this ground was filled in with a stem stitch, one column slanting to the left, the next slanting to the right, etc. Like the example above, some even have a ‘seam stitch’ column in them. 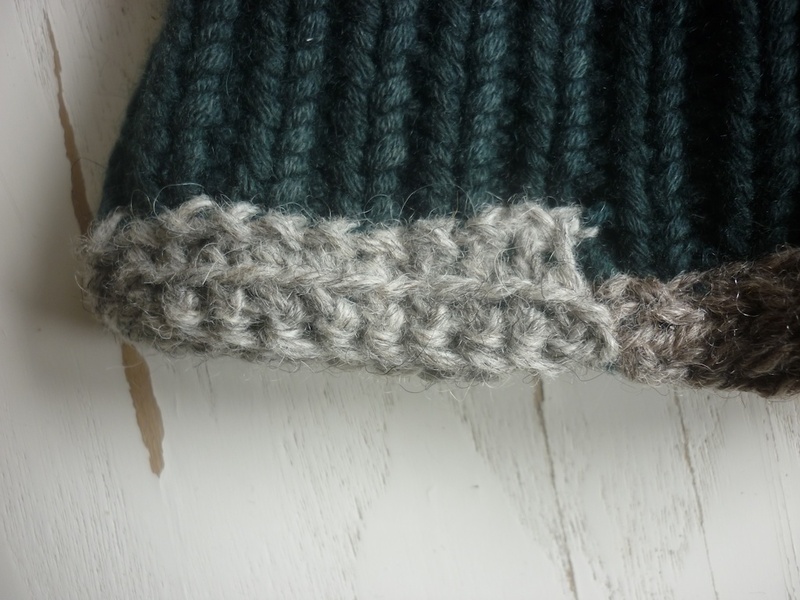 The seam stitch in sock knitting refers to a column of purl stitches at the back of the leg. Some of the samplers have a beautiful darn in the middle, with points radiating out as a star. I don’t know if this was purely decorative, or had a practical purpose as well. 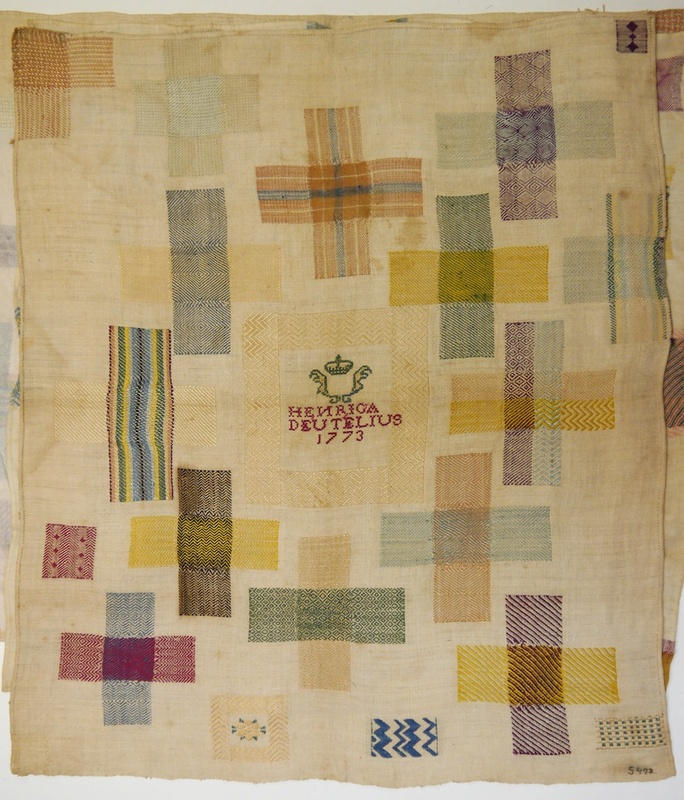 The sampler above also shows a number of darns to be used on a variety of checked fabrics used for tea towels etc. 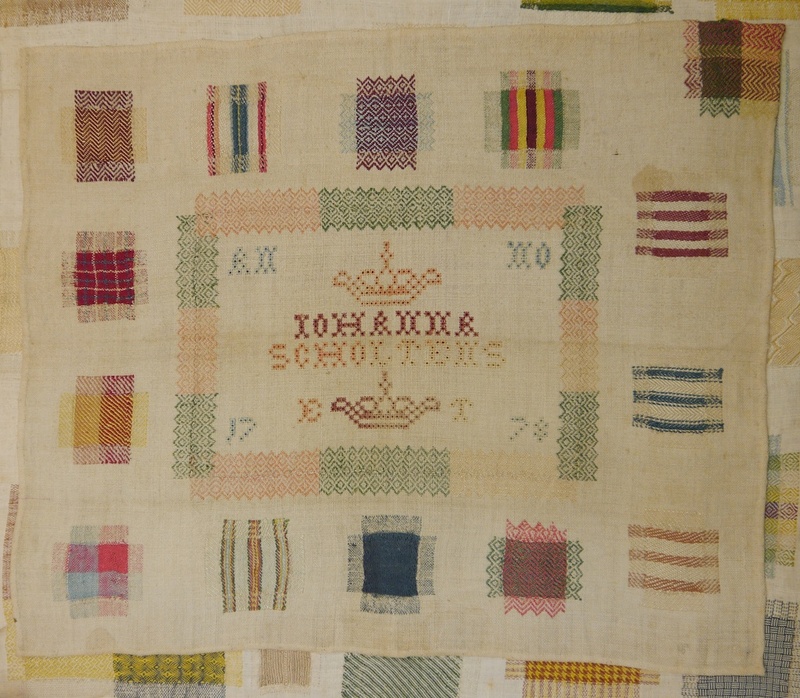 I know these patterned textiles as ‘Brabants bont’ (‘Brabantian multi-colour’) – another province of The Netherlands known for their textiles; in fact, the Textile Museum in Tilburg is in the province of Brabant. Having the darning samplers right in front of me meant I could inspect the back as well as the front. It’s an urge that I’m sure many an embroiderer will recognise! What’s immediately obvious are the little looped fringes on the edge of each darn. These loops are created when turning around to work your way back. As the fabric being repaired usually has been washed a number of times, it will have shrunk in the process. However, the darns are made with new threads, probably never washed, so the loops will allow for the darned patch to shrink when eventually it is washed, without pulling the fabric around it together. I could also see (and confirmed this in some of the old needlecraft books) that the edges of a hole would be trimmed to have straight edges, cut right along one thread. Once the darning is complete, the fabric threads will have nowhere to go, and thus the edges require no further finishing off. 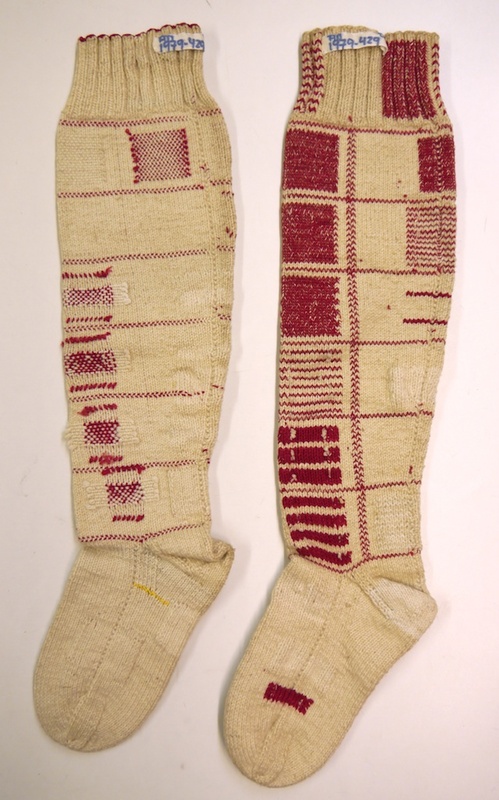 There are two interesting things about the darning sampler by Catharina Alida Kiers. First of all, you can see that one of the darns has developed a hole. This is most likely due to the dye used to make the black thread. Synthetic dyes didn’t come into existence for another seventy years or so, and therefore the black was probably achieved by using black walnut. This dye actually slowly damages the fibre over time, and you will often see that old textiles are more fragile, or have started to disintegrate, in the areas of black or dark brown colour. 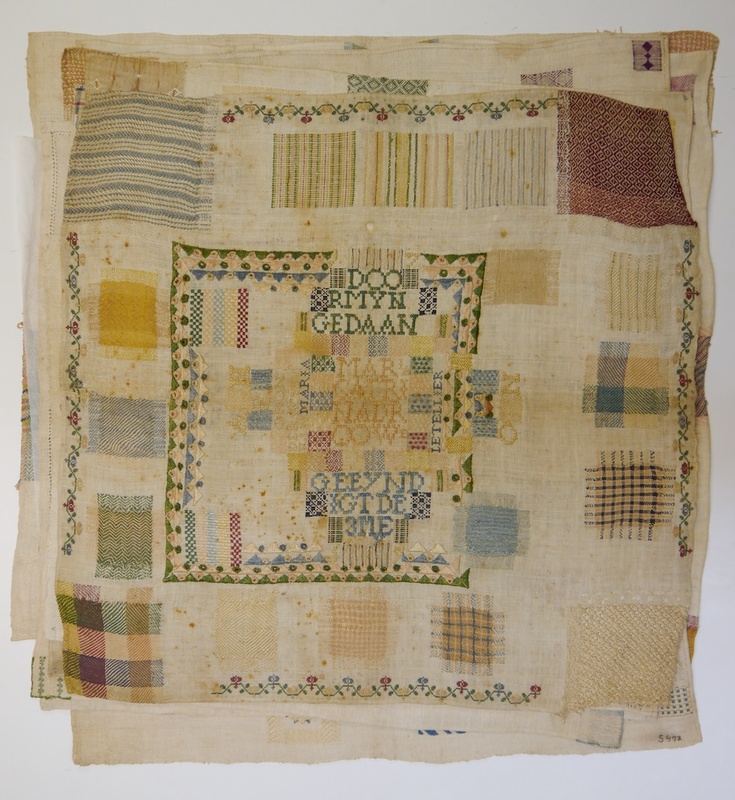 The other thing to note about this sampler, is that it uses some of the same darning patterns, and has the same crest above and border around the name as the sampler made by Henrica Deutelius above. 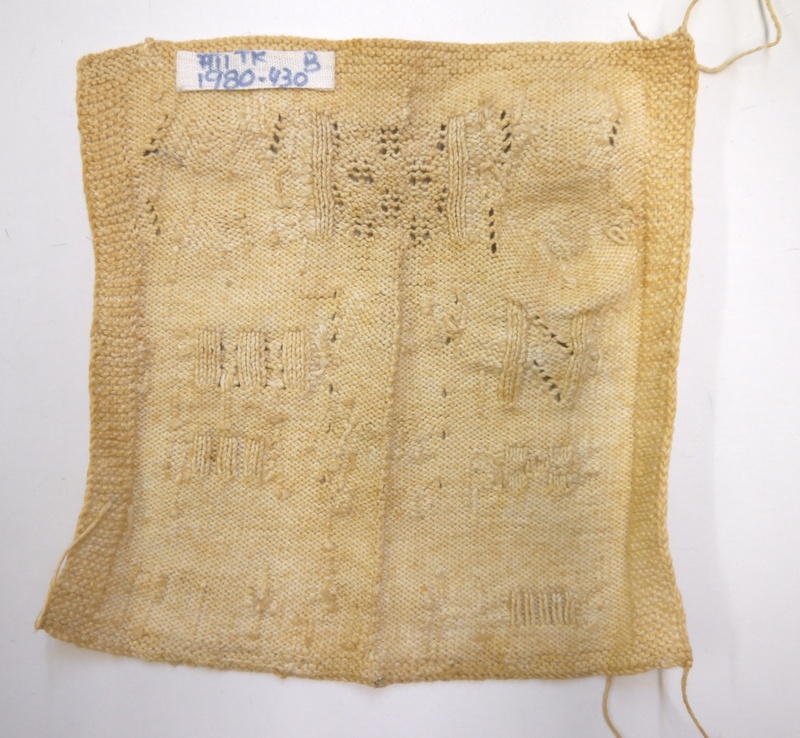 These kind of features allow textile historians to trace samplers back to a specific area and learn more about their provenance. In all likelihood these girls went to the same school, or at least had the same ‘useful needlecraft’ teacher. 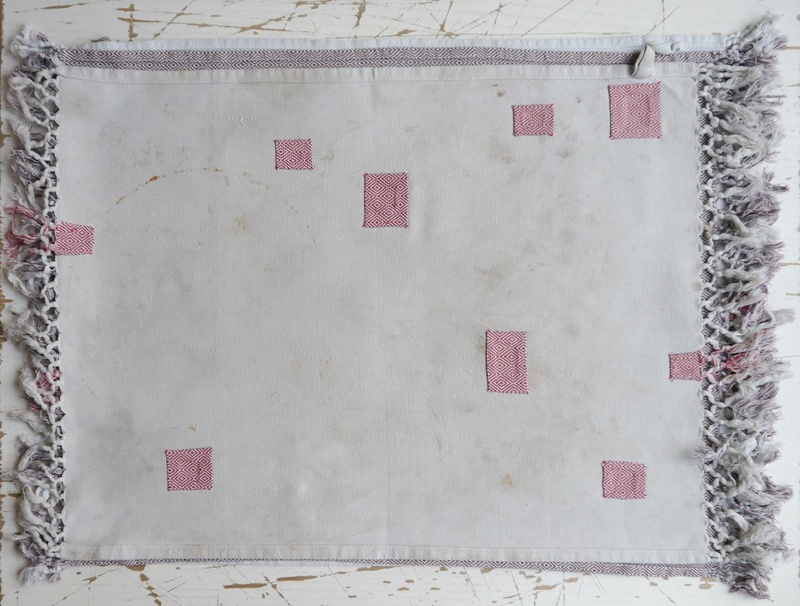 Many darning samplers not only have darns in the middle of the fabric, but also at the edges or even corners. 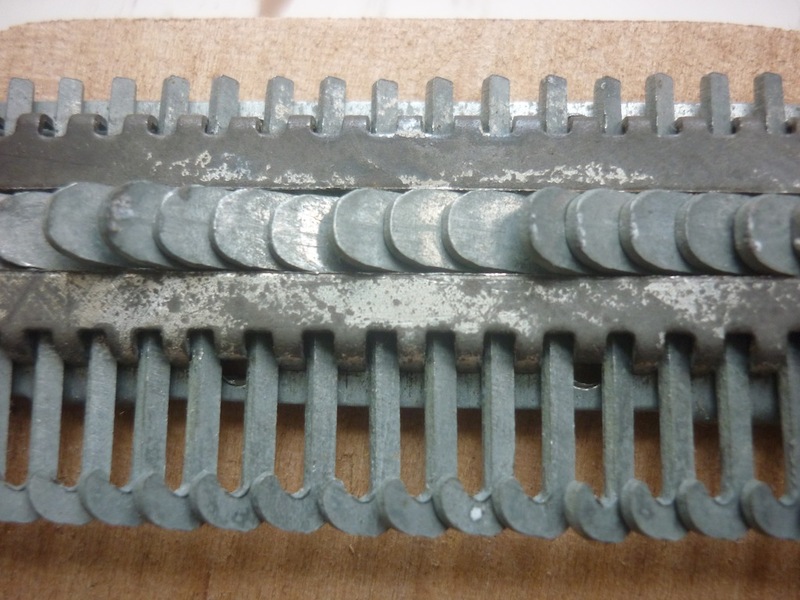 This is a more challenging darn, and they were achieved by temporarily sewing some card or stiff paper on the back of the hole, which will help as an aid to span the threads across. As you can see in the examples here, getting the tension right is really difficult, and I think if this sampler were ever to be washed, they would pull together even more. I hope you enjoyed seeing some of these samplers as much as I did, and I’d like to finish this post with an observation that Gieneke made: although many girls were taught how to make beautifully inconspicuous darns, the many items of clothing in the Fries Museum collection show that once they had finished school, these girls either didn’t have the time or inclination to apply their skills: many skirts and shirts show hastily executed darns, only there to fill in a gap in any old way possible. 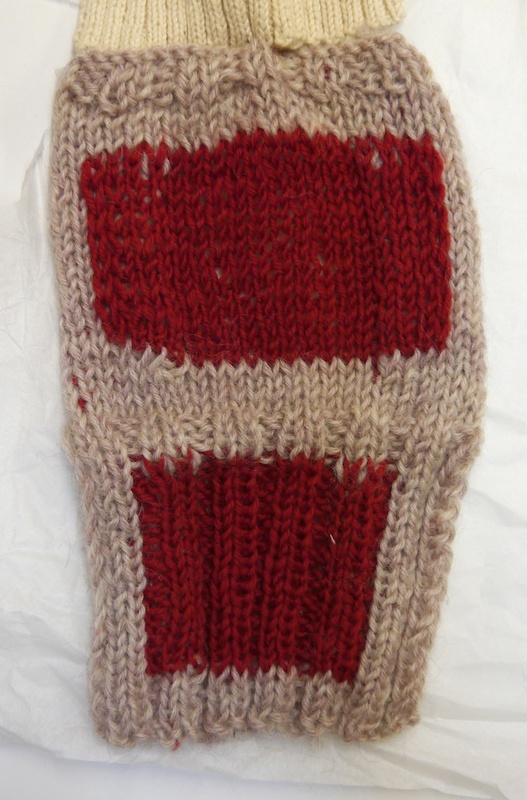 Also keep an eye out to my third blog post, in which I will share some of the knitted darning samplers – all I can say is: you’re in for a treat! I have a pullover that my mother knitted me in the 1980s. It was cream coloured natural wool — I’ve since dyed it grey. 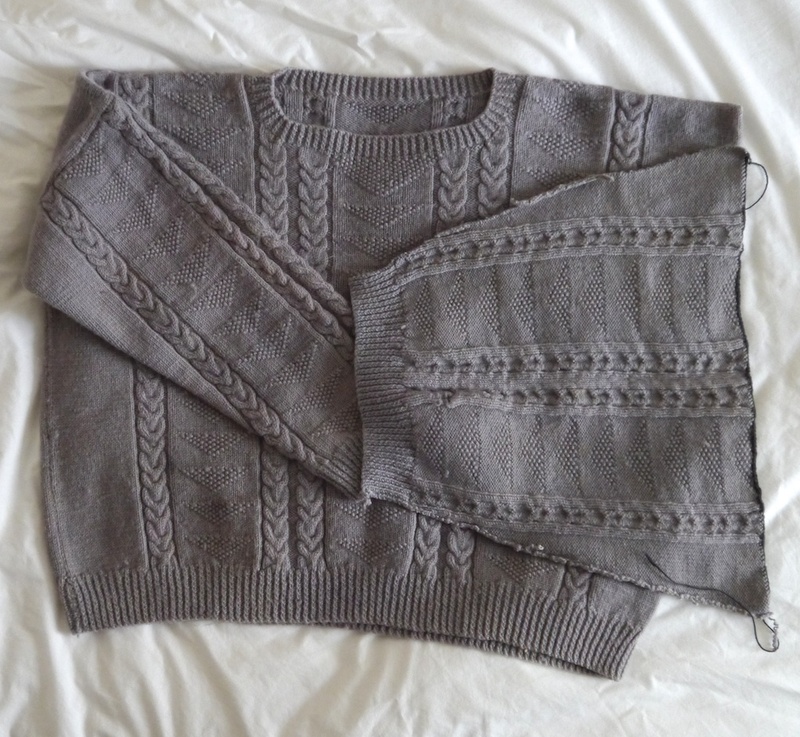 It’s a typically big and baggy eighties style from a pattern by Edina Ronay. It didn’t really suit me, the undyed colour was a kind of dirty cream and the neckline is wrong. There’s a lot of my mother’s work in this garment. I don’t want to get rid of it – it’s about 25 years old and it’s been at the back of a cupboard for a long time. So I had an idea to make it wearable by dyeing it grey. This wasn’t wholly successful. The colour is a bit patchy but on the whole I prefer it to the cream. It still looked massive on me. 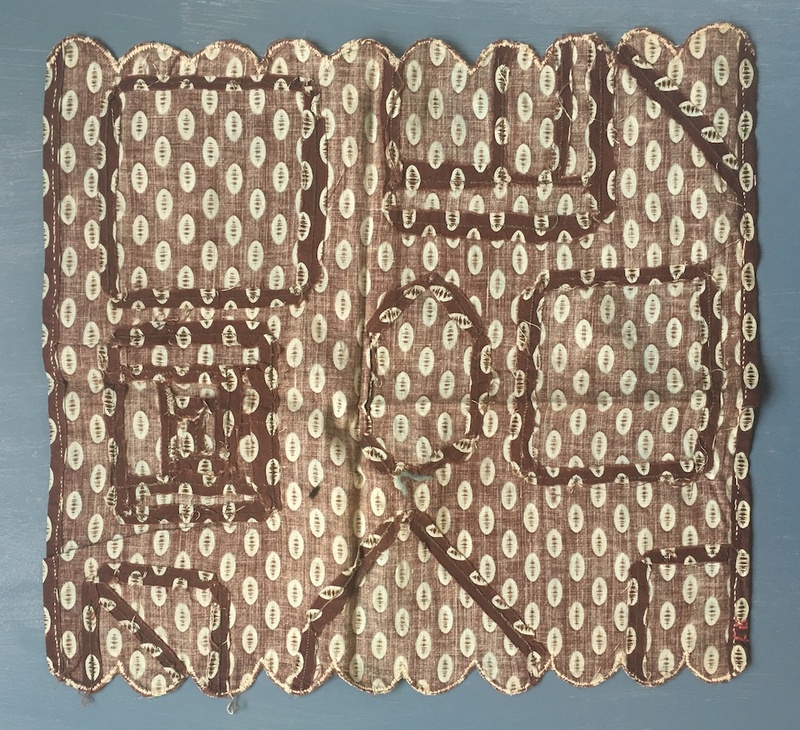 I had another idea to turn it into a cushion – it’s got nice (I think Guernsey) textured patterns all over it and the body would be big enough to make a substantial cushion cover. So I cut off one of the sleeves, with a view to hacking the thing to bits to make a cushion. As soon as I’d cut off the sleeve I regretted it. There’s a small hole in one sleeve too. The pullover means a lot to me, especially since my mother died a couple of years ago. We didn’t have much in common and knitting is one of my only true connections to her. We exchanged a few emails so I could get a feel of what she wanted and come up with a repair strategy before meeting up. Thank you for your kind reply. I’m so glad you understand about the jumper – and about mothers! I’m sure my own mother would think I was completely mad to be trying to fix up this old jumper she made. As you can see – not only did I cut off a sleeve, I also cut open the seam of the sleeve. Why – I couldn’t really say at this point. The wool is a bit felted through age, so nothing has come unravelled at all. 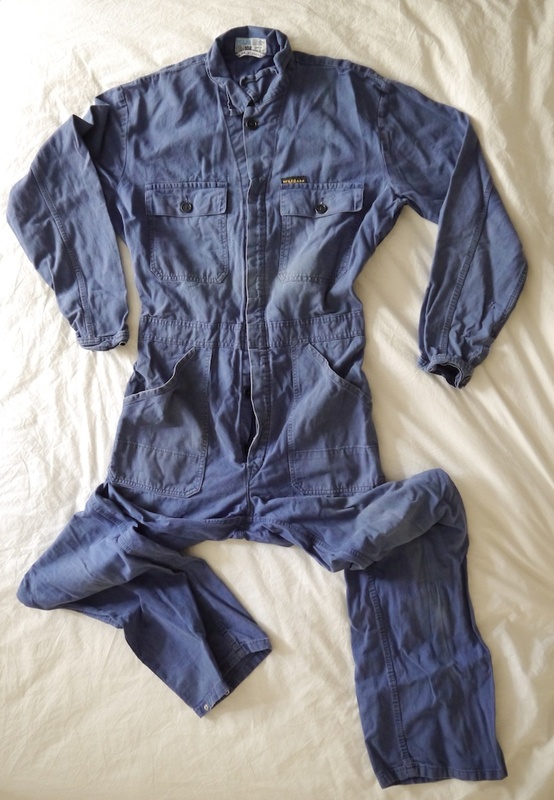 Re the neckline – it used to be a lot wider. I think maybe the jumper has shrunk a little bit because the neckline doesn’t seem so wide as I remember it. I guess it’s okay how it is. I had to come up with a way of reconstructing the sleeve without losing too much of the original knitting. As the sleeve had been cut off and open, rather than carefully unpicked at the seams, I had some unravelling to do and fill in the missing inch at the very top of the sleeve cap. I also needed to do something about the side seams, as these could not be sewn together as they were. 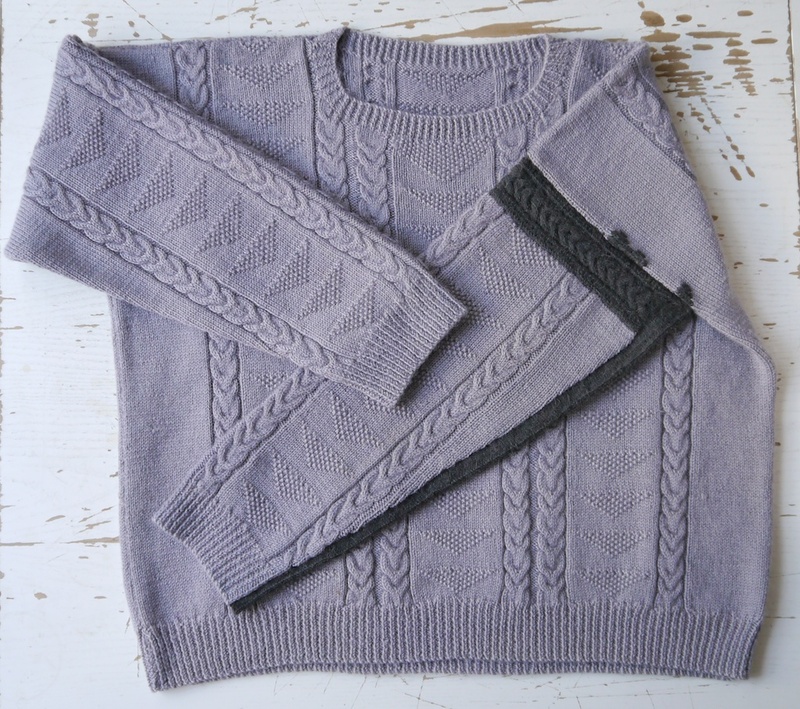 Looking for a colour that would provide some contrast, yet harmonise well with the lavender grey of the jumper, I settled on a dark grey alpaca sock yarn. 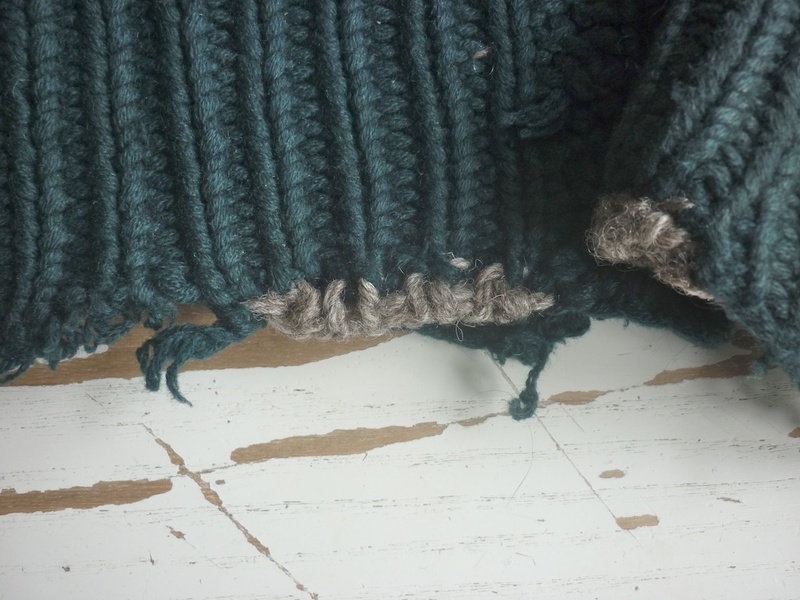 I chose a cable stitch that resembled the stitch in the jumper, but wasn’t quite the same to reinforce the idea that this repair was not done by the person who originally knitted the garment. Picking up stitches from somebody else’s work felt really intimate, and throughout the repair my thoughts went out to Bernadette, and her mother. 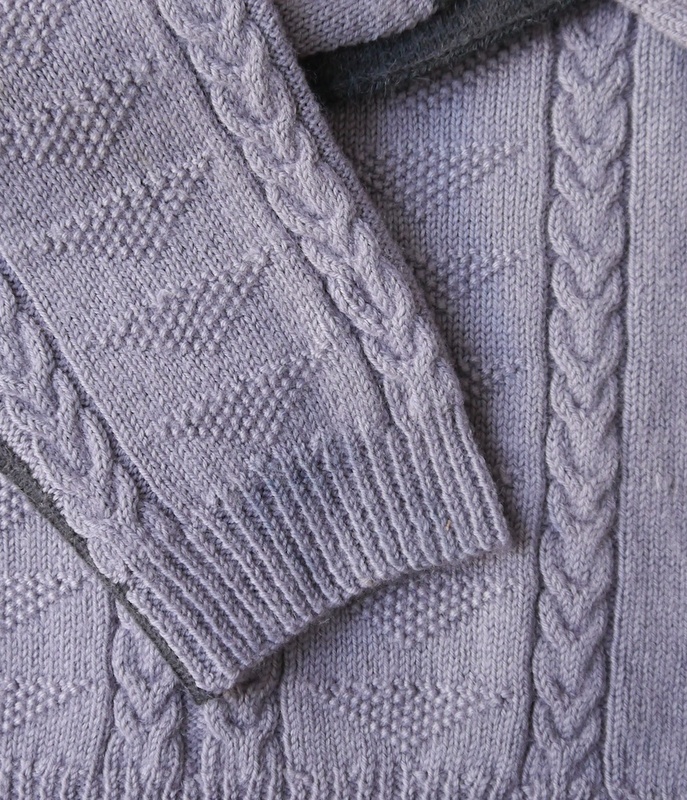 I admired the skill and effort that went into making this jumper, the even stitches. I have never met Bernadette’s mother, but picking up her work forged a connection, and I imagined how she worked on this jumper. I will never know what might have gone through her mind, yet I was wondering about this; wondering what she would’ve thought about her daughter asking to do this Visible Mend. One invisible mend is hiding on the sleeve – can you see it? As I had some original yarn from unravelling the untidy cut edges, I did an invisible mend on the hole in the sleeve. I felt that another, seemingly randomly placed visible mend would distract from the visible sleeve reconstruction. 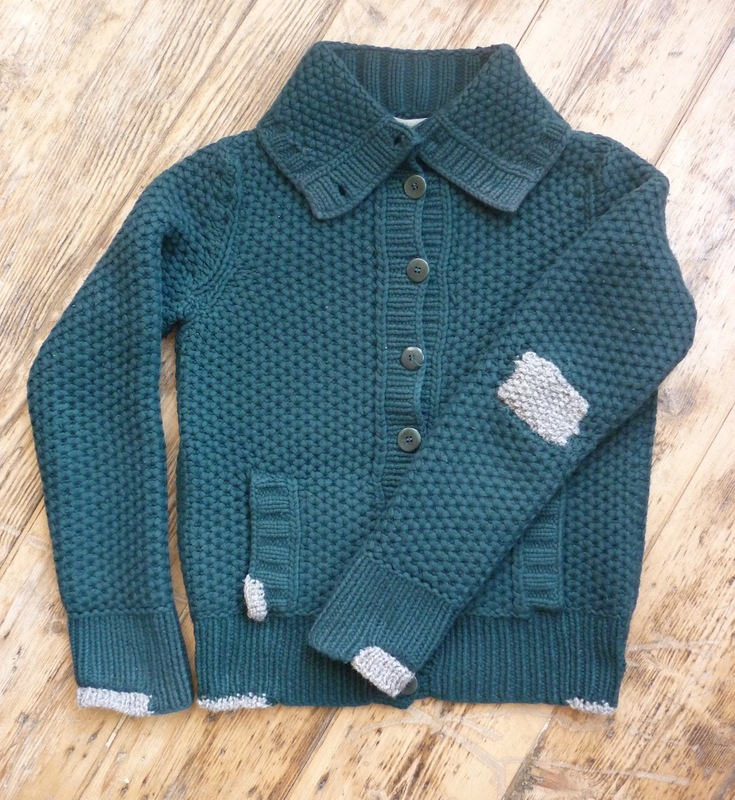 Once I had sewn up the jumper, I ‘de-pilled’ it, and then gently hand-washed it before blocking it. I had asked Bernadette not to wash the jumper before giving it to me for repair, as this might inadvertently do more damage: stitches might unravel, or more felting might occur. As always, once I feel I’ve completed the repair, the final touch was stitching the Visible Mending Programme initials into the garment. I guess you might want to know what the jumper looks like now? It really does mean a lot that I still have the jumper. My mum always tried to make me the jumpers that I chose patterns for. Unfortunately I had such bad taste back in the 80s that they were mostly horrible, but it wasn’t my Mum’s fault. When I was older my Mum made my children quite a few little things, but none of the garments have been hardy enough to survive. There was one pink fair isle twinset she made my daughter that I really hoped to keep but a moth ate holes in it and it made me feel sad to look at it, and I eventually got rid of it. 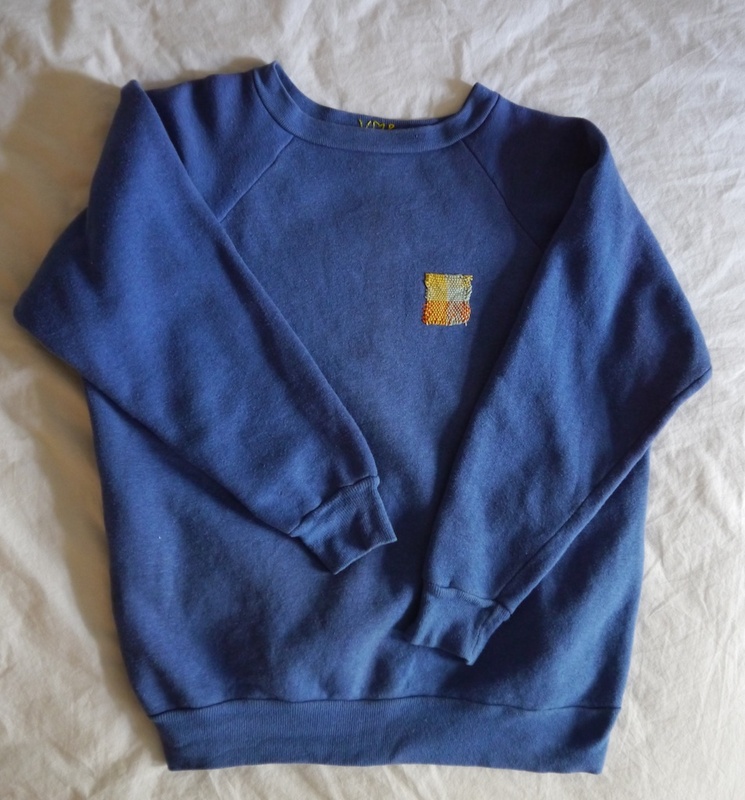 So this jumper that you are rescuing is the one surviving garment (apart from an astonishing array of teddy trousers and dresses in acrylic!). Last week, I showed you two invisible mending commissions I took on. However, there was a third garment to be repaired. What’s more, it’s not the first time I have tackled it. Remember That Green Cardigan? I hadn’t seen it for a while, and as Zoë has been wearing it day in, day out since it was repaired first time around, it started showing some more fraying, elbow holes and snags. But it was also very nice to see how the old repairs had really settled in; they look like they were always there. 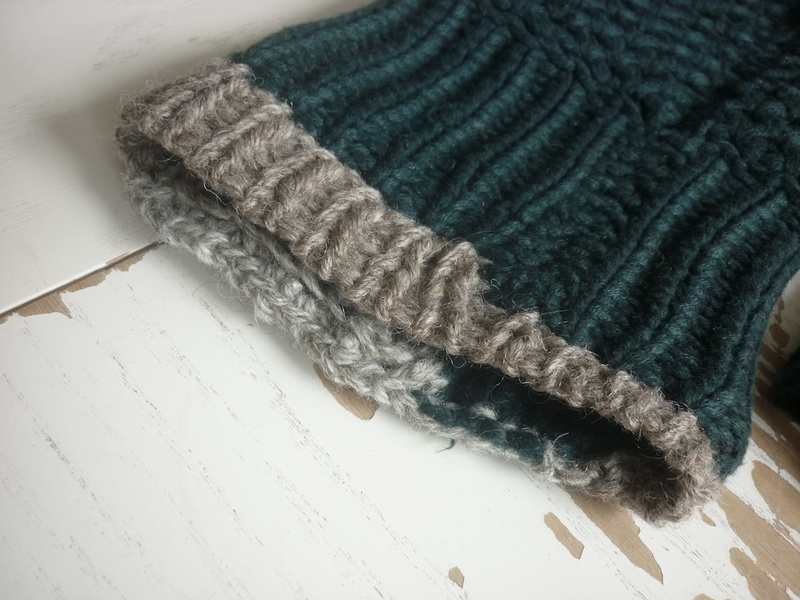 This time, I used Foula wool for repairs. It’s a somewhat different shade of grey, but the texture is quite similar to the Jacob wool I used previously. Assuming the cardigan will keep returning for more repairs over the coming years, I’d like to continue using different shades of grey (although I doubt I’ll get up to fifty…), making each repair episode discrete, yet all together they form a coherent story. 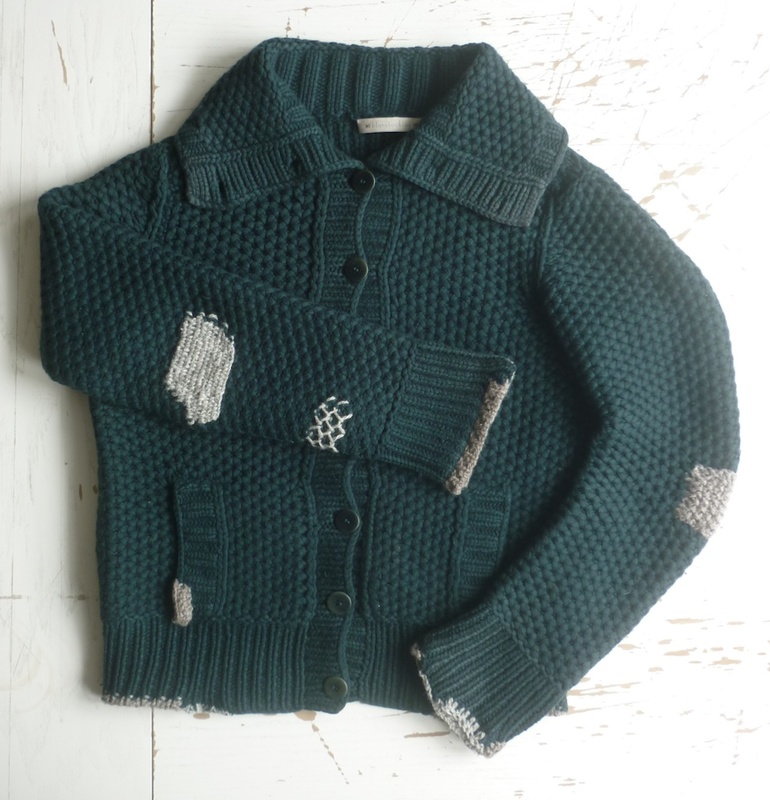 Zoë’s cardigan is fit for another round of heavy-duty work, which is just as well, as she spends lots of time in the forest, working for Wilderness Wood. 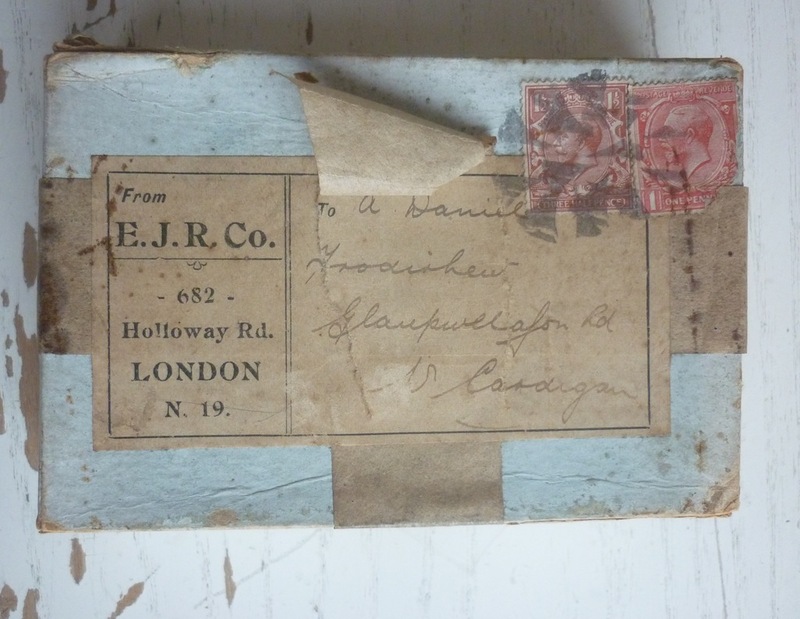 Those stamps are surely Edwardian! I cannot find any records of E.J.R. Co., but 682 Holloway Road now houses a unisex hair salon. 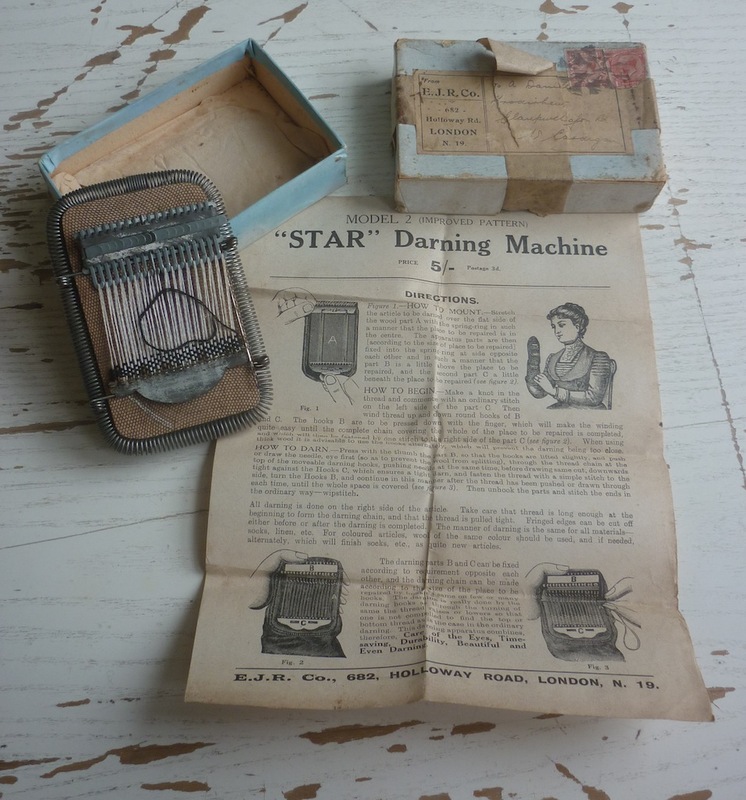 This STAR Darning Machine was sent to a certain A Daniel, who lived in Cardigan, Wales. I learnt from a Welsh colleague that the first line of the address is most likely the house name, and we think it might be a variant spelling of “throedrhiw” which means Foot of the Hill. The road is called “Glanpwllafon” which means Bank of a River Pool. I haven’t had a chance yet to try this new darning machine, but it is clear I can create a larger patch than with the Speedweve, and it will probably be a bit neater, too. On the other hand, once the darn is finished and the loom has been disengaged from the woven patch, there will be two sides to sew down. 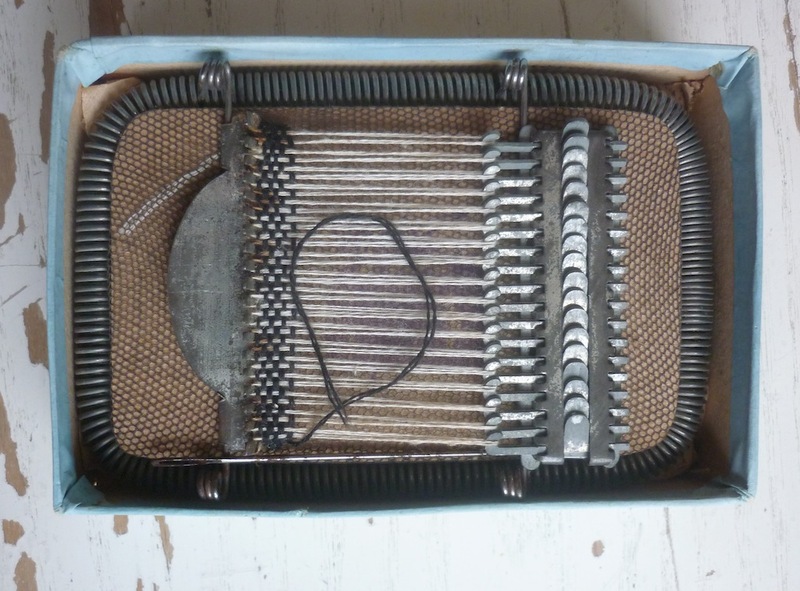 The loom parts are a bit rusty and tarnished, so they can do with a clean before I can use my STAR Darning Machine. I shall report back once I have used it.